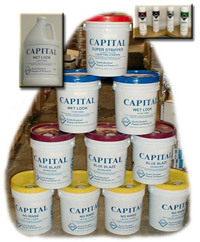 At Capital we provide a wide range of cleaning and chemical products that will suit your industrial and janitorial needs. We also offer our own top quality line of floor cleaners and chemicals including strippers, waxes and no rinse floor cleaners. TimeMist Classic - Simple reliability. The TimeMist Classic offers 4 color options in a simple and reliable automatic metered dispenser. It provides maximum odor control at a minimum cost. 5-year quality guarantee.